How do we make sense of the recent climate change news? And what can we do? 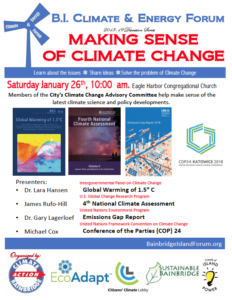 On Saturday, January 26 at 10am at Eagle Harbor Congregational Church, the Climate & Energy Forum will host a discussion about the latest climate science and policy developments. Then, on February 7 at 7pm, the movie, The Venus Theory, will be shown at the Library. 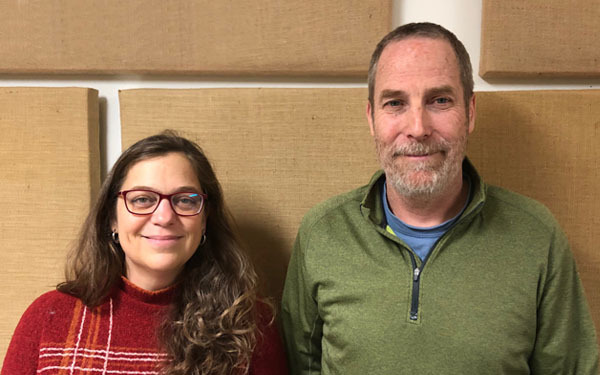 Listen here as returning guests Michael Cox and Lara Hansen share information about these two upcoming events and talk about what individuals and the City of Bainbridge can do to mitigate and adapt to climate change. At the Forum, Michael and Lara will join with fellow presenters, James Rufo-Hill and Dr. Gary Lagerloef, to discuss highlights from various reports by the Intergovernmental Panel on Climate Change, the U.S. Global Change Research Program, the United Nations’ Environment Program and Framework Convention on Climate Change. For more information on the Climate and Energy Forum visit: www.bainbridgeislandforum.org. The Venus Theory is being shown at the Library on February 7th as part of the Movies That Matter film series, a free monthly film series on environmental topics offered on the first Thursday of every month. This particular film explains the science behind global warming, and whether the Earth’s temperature may one day equal that of Venus.